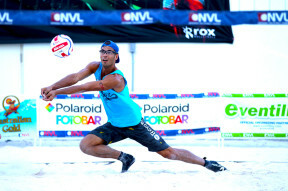 The National Volleyball league visited Las Vegas, Nevada for the $50,000 Best of the NVL Championships hosted both at Sunset Park and at the lavish venue of the Tropicana Hotel Beach Club. The event was the 2nd annual Best of the NVL played in Las Vegas and the tournament was played in a round robin format. The crown on the Women’s side went to the talented Karolina Sowala. She and selected partner Michelle Moriarity-Lonergran and took down opponents Erin Gray and Amanda Dowdy in a heated 3 set battle 21-18, 18-21, 16-14. The men’s crown was taken down by Piotr “Jump-Bump Set” Marciniak who defeated the team of 2012 Olympian Josh Binstock and Travis Schoonover 21-17, 21-15 with his selected partner, Sam Schachter. “It is a great place to celebrate another great year for the NVL ,” stated CEO Albert Hannemann,.”We are so thankful for the overwhelming support from the players, fans, and sponsors and can’t wait for another great season in 2014. The NVL hosted tournaments in Dallas, TX, Mason, OH and Hermosa Beach all of which were used to give players points and seeding into this final Best of the NVL Las Vegas event. The NVL has some exciting things planned for 2014, including the emergence of its new 8 court beach volleyball facility at Club Med in Port St. Lucie, Florida , and the NVL Junior Series along with several new pro tour events.